Do you order organic fruit and vegetables from Riverford? Did you know that they have a restaurant in Devon, called the Riverford Field Kitchen? 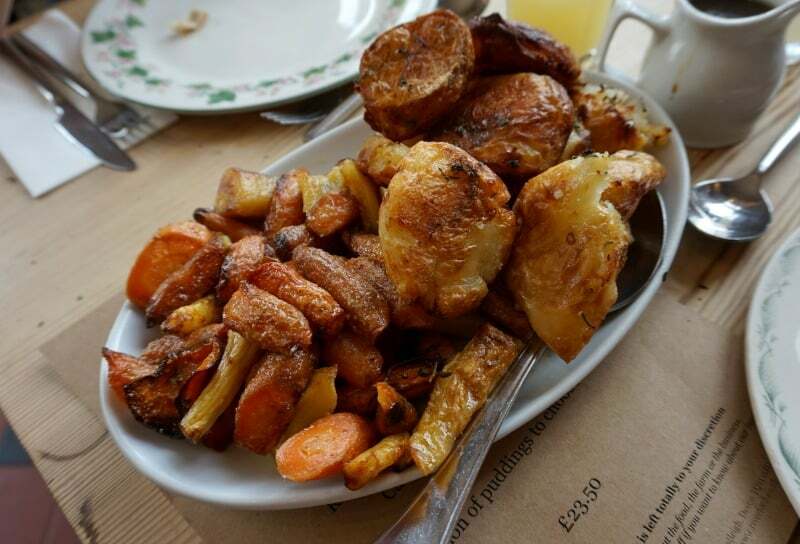 If it’s a restaurant you are interested in then read on to find out about our delicious family Sunday dinner and our Riverford farm tour. We met the Head Gardener Penny Hemming at Riverford Field Kitchen to begin our tour, which started with a peek inside the Riverford Field Kitchen poly tunnel. I was really excited about this tour as I feel so strongly about children understanding how food is grown and where it comes from. Going to Riverford for the farm tour seemed like the natural step after our expereince at the lambing weekend in Cornwall. Inside the polytunnel we were introduced to the Riverford organic concept, which is to provide it’s customers with food boxes packed with a variety of textures, flavours and colour. We all had a taste of the different leaves that make it into the Riverford salad boxes and they were delicious. Brook particularly enjoyed eating the Tsai Tai, these tasty little yellow flowers that caught her eye and impressed her little taste buds. I think she would have worked her way through the entire plant given half the chance. We left the polytunnel behind, before Brook cold eat the entire contents, and jumped in the landcover to learn more about the operation at Riverford. If you are even slightly curious about how your Riverford delivery is grown, cultivated, packed and arrives at your door I think you will feel enlightened and impressed with this Devon farm tour. In case you aren’t familiar with Riverford, they sell organic vegetable boxes and a range of other products that you can select for home delivery. They cover most parts of the UK and deliver on average 55,000 boxes per week. They started by growing vegetables to supply supermarket chains, but soon became dissiliosned with the process, and turned to a trialing a home delivery service in the local area. Well lets just say it took off and has turned into a hugely successful UK farming business. 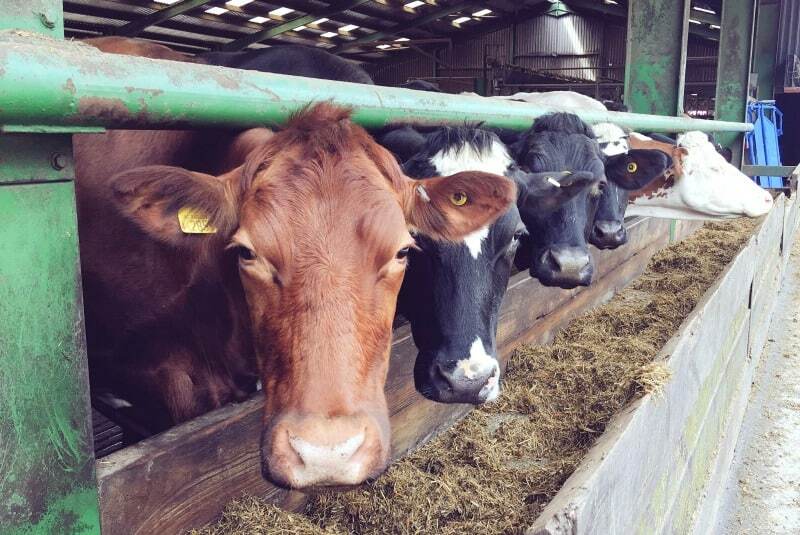 They believe organic farming is the best for eating and the environment and follow these principles across the business. We were able to see the large poly tunnels where the crops are grown at Riverford Farm. Sadly, things were a little slow getting underway due to the cold and wet weather we’ve had in the early part of the year but the team had it all in hand. We also visited the family farm shop and milking sheds. These are in fact separate businesses, but what was clear was that despite the size of Riverford now it still followed the principles of a family run business and valued it’s employees and partners. They are a business committed to offering a fair deal to all it’s stakeholders, including farmers and customers alike. Before ending our farm tour we went to the distribution warehouse and were told how a lot of effort went into storing the various vegetables at the correct temperature and ensuring only quality products were dispatched to the local distributors. Once we’d seen the whole operation, we were taken back to the polytunnel and the girls got the chance to eat more flowers and water the plants. It was a lovely way to end the tour, thinking about how we tend to plants and help things to grow. What is Riverford Field Kitchen Like? By this time, we were due to head into the Riverford Field Kitchen Restaurant and be served a Sunday dinner with a difference. The atmosphere at the Riverford restaurant is relaxed, rustic and somewhat akin to being in a very well kept barn. The tables were literally full with families and parties celebrating important events in their lives like significant birthdays. The vegetables really are the star of the show here and the menu was packed with course upon course of fresh organic produce from Riverford Farm. The first to arrive was the incredibly crisp and colourful salad made from purple purple sprouting broccoli, ajo blanco pickled cucumber and soused onion. What followed next were more vegetables dressed and enhanced with delicious flavours that were more than just a little pleasing to the palette. It opened my eyes to how a plate of vibrant greens can become a centre piece dish given the right flavours to balance off. The whole expereince came to a crescendo when the roast beef and feather blade with Yorkshire puddings and horseradish kaffir cream arrived at the table. The beef was utterly delicious, but it was the flavours of the roasted root vegetables and the crisp potatoes that really hit the spot. We were doing our best to work our way through all the food we had been given, but the staff sensed we probably weren’t going to make it and offered to box up our left overs for us to take home. It made for the most delicious breakfast the next day, I can tell you. Dessert is a ceremony all of it’s own at Riverford Field Kitchen and you are taken up to the counter table by table to be introduced to the selection on offer. If you can’t pick just one, and trust me you will struggle with that, you can have 2 small portions of different desserts. Thank goodness, I thought, as it would have taken me all day to decide between the chocolate torte and the cheese cake. What a high to end on I can tell you. Seeing as the sun was shining, given how rare that’s been this year, we stepped outside to enjoy our coffee and let the girls explore the gardens. They climbed the wooden tractor and played on the swings while we enjoyed that very satisfied feeling you get after sharing a very special sunday afternoon with the family. 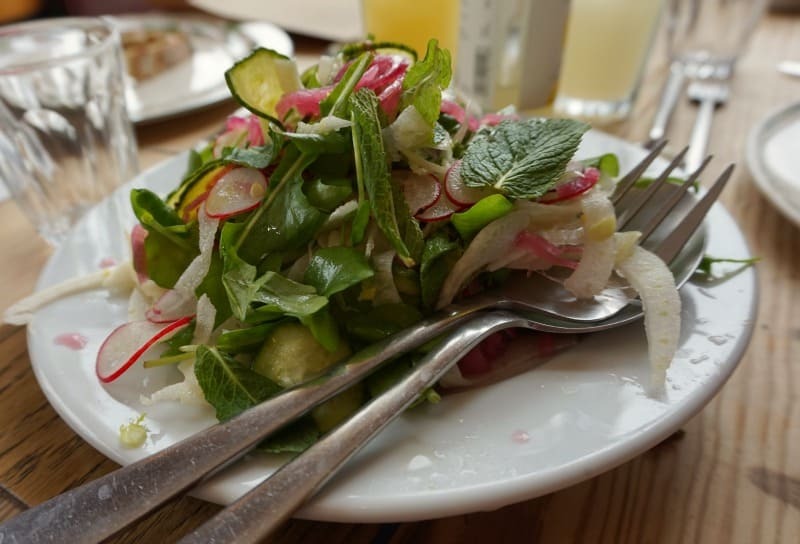 If you are visiting Devon, and you are in need of somewhere a little bit special for a family meal I can very much recommend booking a table at Riverford Field Kitchen. 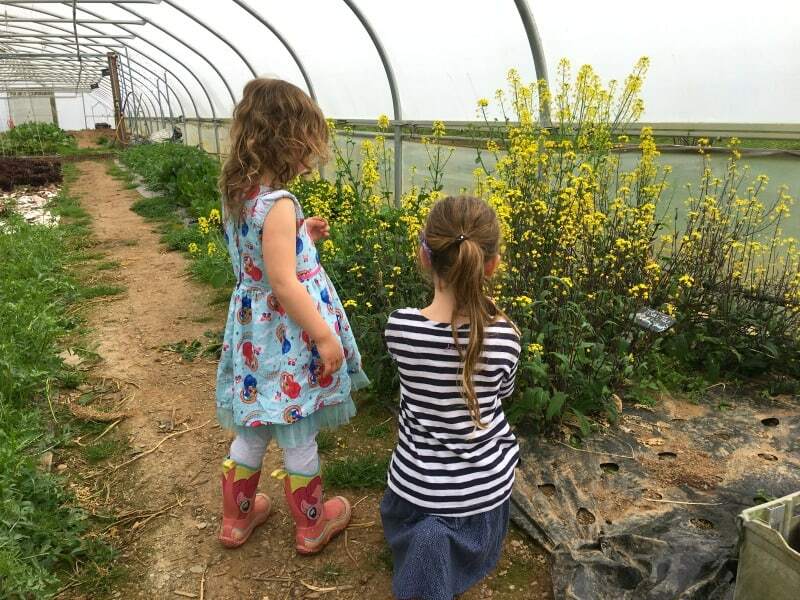 If you are interested in the back story of Riverford and would like to know some more about their operation, then adding the farm tour will definitely complete your experience. We found it to be informative, engaging and very enjoyable. Yes, you must book in advance. They cater for the number of people booked into the restaurant to reduce the amount of food waste. Where is Riverford Field Kitchen? What are Riverford Field Kitchen prices? What times does Riverford Field Kitchen open? For lunch service Mon to Sat: Arrive 12.30pm for 1pm / Sunday: Arrive at 12.00 for 12.30pm or 3.30pm for 4pm depending on your booking. For supper arrive 7pm for 7.30pm. 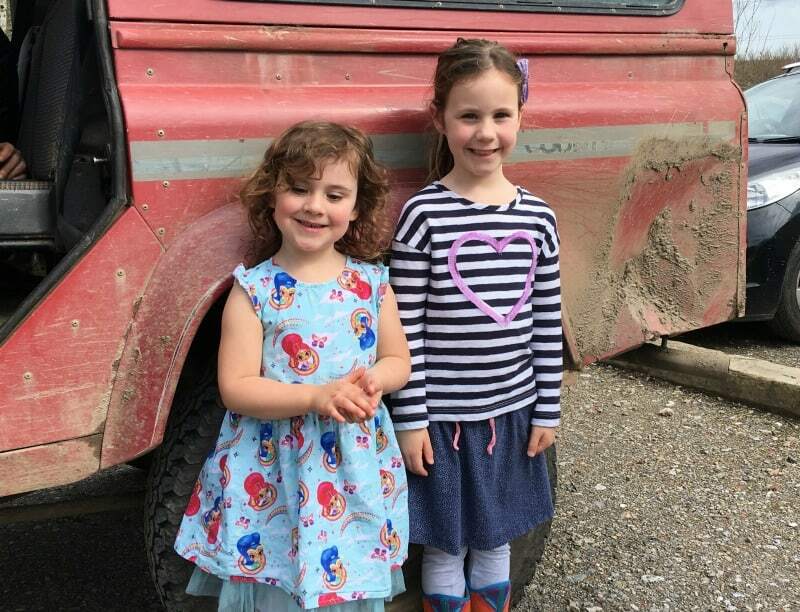 We were invited to Riverford Field Kitchen for Sunday Dinner and to take part in the farm tour for the purposes of this review but all thoughts and opinions are our own.